The rigor of operating outside the atmosphere has often led to rather outlandish NASA vehicle designs, but few have been more alien than this mobile lunar field laboratory from the heyday of the Space Age. Shame it never actually made it past New Mexico. We had such big plans for the moon. After the crew of Apollo 11 set foot on our nearest celestial neighbor, NASA set its sights on more in-depth missions, further exploration of the lunar surface, and eventually even a permanent moon base. Part of the initial thrust of this plan involved longer missions lasting up to two weeks away from a primary research site. But rather than try to stuff a fortnight's worth of oxygen and supplies into a space suit, NASA developed the MOLAB, a roving laboratory that doubled as an artificial habitat for astronauts in the field. Development on the MOLAB began in 1963 as an Apollo Logistics Support System. GM designed and constructed the mobile lab over the course of the next year under contract with NASA. The MOLAB, which was powered by a modified Corvair engine, can could accommodate a pair of astronauts within its 13 square meter cabin for up to two weeks, though modifications to the loadout and subsystems would also have allowed the MOLAB to handle three astronauts for a shorter duration or travel further afield by carrying fewer supplies. GM completed the MOLAB (or "MGL" for "Mobile Geological Laboratory") in 1964 for NASA's use in the Apollo astronaut program. It was built and developed by GM engineer Vic Hickey and is one of the most unusual Corvair-powered vehicles ever built. NASA used MOLAB for seven years, developing moon suits for the Apollo astronauts (who actually trained in and drove MOLAB in the New Mexico desert). It was loaned to the U.S. Geological Survey and performed groundbreaking work mapping mineral deposits and taking soil samples. The MOLAB marked an important milestone in rover technology, representing our ambitious lunar goals, however its fate was tied inextricably to the development of additional support systems. Like an actual lunar base. When permanent plans for lunar colonization fizzled, so to did the need to get around up there. 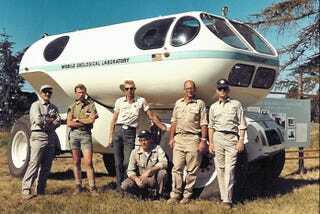 Top Image: Mobile Laboratory (MOLAB) or Mobile Geologic Laboratory (MGL) designed for NASA by General Motors in 1965 for NASA as a prototype, extended lunar mission vehicle; (a) (l to r) Hal Stephens, Ivo Lucchitta, Bill Tinnin, Bob Sutton and two others (unidentified) standing in front of MOLAB; USGS photo USGS Open-File Report 2005-1190, Figure 023a.